After two days of sailing through the desert, Stage 3 finally provides a significant uphill challenge to the peloton as the race looks to rearrange the general classification with a testing climb to the finish line. The 150km journey from Al Ain to Jebel Hafeet is another predominantly flat affair, teeing up the climbers for the ascent to the line which is certain to decide this year’s overall winner of the Abu Dhabi Tour. 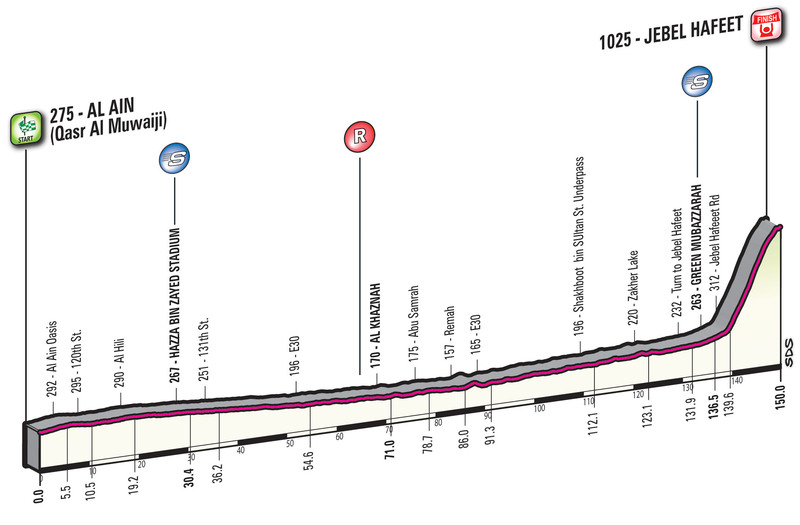 Having stayed safe throughout the day’s flat section, those with an eye on victory shall begin the 10.8km climb which averages 6.6% and possesses a maximum of 11% just before it eases ahead of the finish. With this in mind, any rider with a potent kick who survives the initial selection process upon the lower slopes will become a clear favourite to win the day. Vincenzo Nibali has ridden relatively lightly since this year’s Tour de France and was one of the main protagonists on this same stage last year; his crash at the Olympic Road Race keeping him off the bike until now. The Italian could sign off from his time at Astana with a final victory ahead of his move across to the brand new Bahrain Merida Pro Cycling Team for 2017. There is certainly no doubt that Nibali will survive the ascent and he has a brilliant chance of winning if he manages to ditch the strong puncheurs before making a move in the final kilometres. Alberto Contador is another big name rider leaving his team at the end of this year’s Abu Dhabi Tour, leaving the histrionic Oleg Tinkov’s eponymous squad to join a rejuvenated Trek-Segafredo for 2017. Contador had not raced since his fourth place finish at the Vuelta a España, so is somewhat of a mystery in regards to anticipating his form right now. This shorter ascent may not play to his strengths which have seen him dominate grand tours for so long, but there is no reason to think he cannot at least follow the main contenders. Diego Ulissi could catch the climbers napping here if he manages to stay in contention during the ascent and then strike out with one of his famous uphill sprints. Given that the road does ease ahead of the summit, Ulissi has a strong chance of putting the purer climbers to bed with on well timed attack within view of the finish line as nobody can match him upon his favoured terrain. Andrey Amador has a rare chance to lead Movistar in the absence of both Nairo Quintana and Alejandro Valverde, no doubt looking to make this opportunity count by winning today’s summit finish. He has enjoyed a successful year while riding in support of his team leaders and is sure to view this as a golden chance to add to his sole career win; a statistic difficult to believe. Nicolas Roche looks to be Sky’s best chance of featuring well today, the Irishman arriving in Abu Dhabi to sign off from his time at the British outfit ahead of his move to BMC next year. He is a strong climber and is actually quite a potent finisher when required to go head to head with a rival for the win. Other names who could all cause a stir are Davide Rebellin, Tanel Kangert, Thomas De Gendt, Alexandr Kolobnev, Christopher Latham and Michal Kwiatkowski. Posted on October 22, 2016 by Spokenforks	This entry was posted in News and tagged 2016, Abu Dhabi Tour, Abu Dhabi Tour Stage 3 Preview, Al Ain, Alberto Contador, Alexandr Kolobnev, Andrey Amador, Astana, CCC Sprandi Polkowice, Christopher Latham, Davide Rebellin, Diego Ulissi, Jebel Hafeet, Lampre-Merida, Lotto-Soudal, Michal Kwiatkowski, Movistar, Nicolas Roche, Saxo Tinkoff, Sky, Tanel Kangert, Team Wiggins, Thomas De Gendt, Vincenzo Nibali. Bookmark the permalink.